Henry Holt and Co., 9781250124210, 334pp. When Mike Lewis was twenty-four and working in a prestigious corporate job, he eagerly wanted to leave and pursue his dream of becoming a professional squash player. But he had questions: When is the right time to move from work that is comfortable to a career you have only dared to dream of? How have other people made such a jump? What did they feel when making that jump—and afterward? Mike sought guidance from others who had “jumped,” and the responses he got—from a banker who started a brewery, a publicist who became a Bishop, a garbage collector who became a furniture designer, and on and on—were so clear-eyed and inspiring that Mike wanted to share what he had learned with others who might be helped by those stories. First, though, he started playing squash professionally. The right book at the right time, When to Jump offers more than forty heartening stories (from the founder of Bonobos, the author of The Big Short, the designer of the Lyft logo, the Humans of New York creator, and many more) and takeaways that will inspire, instruct, and reassure, including the ingenious four-phase Jump Curve. Mike Lewis worked at Bain Capital before chasing his dream of playing professional squash. He is the founder and CEO of When to Jump, a global community of people who have left one path to pursue a very different one. When to Jump has reached millions through media impressions, in-person events, and brand collaborations. 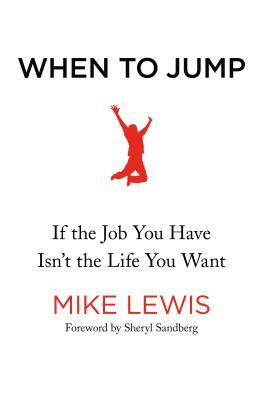 When to Jump, a collection of case studies with clear guidance on how and when to jump, is Mike's first book. He received his BA from Dartmouth College and lives in San Francisco. "I got a little choked up. . . . Take that, Bozo Guidance Counselor." "[When to Jump] offers enough wisdom that readers will return to these stories even after making their own jump." "An easy reading book of supportive encouragement to follow one's dreams."